Bishop Copleston, pictured above, lived in Victorian times. He was responsible for the creation of two boating lakes in what were then his personal gardens in Offwell. His gardens, as befitted a highly placed clergyman, were substantial and covered many acres. The Woodland Education Centre, in Offwell, now occupies about 50 acres of land which was once only part of the Bishop's original pleasure gardens. The southern part of the upper boating lake forms the basis for what is now The Wetland. The lower boating lake was also restored at the same time as The Wetland (see The Wetlands Restoration Project). As well as creating the boating lakes, the Bishop also had Rhododendron ponticum imported from East Asia, to plant in his gardens. This may have been for the spectacular showy purple flowers which bloom in Spring, or possibly to provide cover for game birds. As long as the Rhododendron was kept under control by an army of gardeners, it fulfilled its intended role. However, with the passage of time and historical changes such as fewer people being employed on the land and the dissolution of large estates such as this, the Rhododendron began to take over. By 1988 when restoration began on The Wetland, the area had become more or less completely silted up. The lower part of this lake had essentially become dry land, with a stream cutting through it. Silt brought in with flood water would have settled out in the lake, eventually raising the land level so much that it no longer held water. In between these two extremes, of boating lake and dry land, the area would have gone through a period as wetlands. This then followed a natural succession and eventually completely silted up. This is important because it means that having at one time been an area of wetland, it would have many seeds of wetland plant species within the seed bank in the soil. 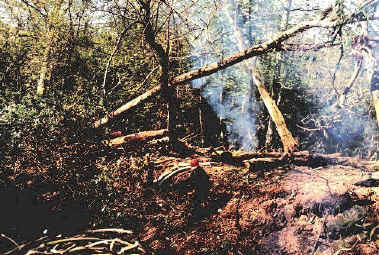 Prior to restoration, Rhododendron had encroached on the area to such an extent that the whole area had become a more or less impenetrable jungle of very limited ecological value.